Patent & IP blog, discussing recent news & scholarship on patents, IP theory & innovation. For those who have not had the pleasure of seeing it, I recommend the fascinating and, honestly, fun, new study by Barton Beebe and Jeanne Fromer on the arbitrariness and unpredictability of the U.S. Patent & Trademark Office's refusals of trademarks that are deemed to be "immoral" or "scandalous." The study, entitled Immoral or Scandalous Marks: An Empirical Analysis, has been posted on SSRN. This paper served as the basis for Professors Beebe and Fromer's amicus brief in Iancu v. Brunetti. This study follows up on Megan Carpenter and Mary Garner's prior 2015 paper, published in the Cardozo Arts & Entertainment Law Journal and Anne Gilson LaLonde and Jerome Gilson's 2011 article, Trademarks Laid Bare: Marks That May Be Scandalous or Immoral. All of these studies come to similar conclusions: there are serious inconsistencies in trademark examiners' application of the Section 2(a) "immoral-or-scandalous" rejection. The Beebe/Fromer study is technically 161 pages long, but it's mostly exhibits, and it's very accessible – worth at least a read to see some of the examples they give, and to oggle at the bizarre interplay between Section 2(a) "immoral-or-scandalous" refusals and Section 2(d) "likely to confuse with prior registered mark" refusals. What was the "promise of the patent doctrine"? What was the "promise of the patent doctrine"? The short answer is: a controversial doctrine that originated in English law and that, until recently, was applied in Canadian patent law to invalidate patents that made a material false promise about the utility of the invention. A common example would be a claim to therapeutic efficacy in a specification that is not born out. Warning: the content of this doctrine this may seem bizarre to those familiar with U.S. patent law. Typically, describing an article as polarizing refers to two different groups having very different views of an article. But I read an article this week that had a polarizing effect within myself. Indeed, it took me so long to get my thoughts together, I couldn't even get a post up last week. That article is Glynn Lunney's draft Copyright's L Curve Problem, which is now on SSRN. The article is a study of user distribution on the video game platform Steam, and the results are really interesting. No one ever argues for copyright on the grounds that superstar artists and authors need more money, but what if that is all, or mostly all, that copyright does? This article presents newly available data on the distribution of players across the PC videogame market. This data reveals an L-shaped distribution of demand. A relative handful of games are extremely popular. The vast majority are not. In the face of an L curve, copyright overpays superstars, but does very little for the average author and for works at the margins of profitability. This makes copyright difficult to justify on either efficiency or fairness grounds. To remedy this, I propose two approaches. First, we should incorporate cost recoupment into the fourth fair use factor. Once a work has recouped its costs, any further use, whether for follow-on creativity or mere duplication, would be fair and non-infringing. Through such an interpretation of fair use, copyright would ensure every socially valuable work a reasonable opportunity to recoup its costs without lavishing socially costly excess incentives on the most popular. Second and alternatively, Congress can make copyright short, narrow, and relatively ineffective at preventing unauthorized copying. If we refuse to use fair use or other doctrines to tailor copyright’s protection on a work-by-work basis and insist that copyright provide generally uniform protection, then efficiency and fairness both require that that uniform protection be far shorter, much narrower, and generally less effective than it presently is. The paper is really an extension of Prof. Lunney's book, Copyright's Excess, which is a good read even if you disagree with it. As Chris Sprigman's JOTWELL review noted, you either buy in to his methodology or you don't. I discuss below why I'm a bit troubled. I started Written Description in February 2011 when I was a 3L at Yale and was winding down my work as a Yale Law Journal Articles Editor, which had been a great opportunity to read a lot of IP scholarship. I noted that there were already many blogs reporting on the latest patent news (like Patently-O and Patent Docs), but that it was "much harder to find information about recent academic scholarship about patent law or broader IP theory." The only similar blog I knew of was Jotwell, but it had only two patent-related posts in 2010. (In 2015, I was invited to join Jotwell as a contributing editor, for which I write one post every spring.) Written Description has grown to include guest posts and other blog authors—currently Camilla Hrdy (since 2013) and Michael Risch (since 2015). Most of my posts have featured scholarship related to IP and innovation. Some posts simply summarize an article's core argument, but my favorite posts have attempted to situate an article (or articles) in the literature and discuss its implications and limitations. I also love using my blog to highlight the work of young scholars, particularly those not yet in faculty positions. And I enjoyed putting together my Classic Patent Scholarship project; inspired by Mike Madison's work on "lost classics" of IP scholarship, I invited scholars to share pre-2000 words that they thought young IP scholars should be aware of. Some posts have focused on how scholarship can inform recent news related to IP. For example, I recently posted about the role of public funding in pharmaceutical research. And I have drawn connections between scholarship and Supreme Court patent cases such as Impression v. Lexmark, Cuozzo v. Lee, Halo v. Pulse, Teva v. Sandoz, FTC v. Actavis, Bowman v. Monsanto, and Microsoft v. i4i. My compilation of Supreme Court patent cases has been cited in some academic articles, and my post on Justice Scalia's IP legacy led to some interesting discussions. I have also reflected on patent law scholarship more generally, such as on how patent law criteria apply to evaluating legal scholarship, what experience is needed to write good scholarship, choosing among academic IP conferences, transitioning from science to patent law, and why IP isn't on the bar exam. I sometimes debate whether blogging is still worth my time. I could instead just post links to recent scholarship on Twitter, or I could stop posting about new scholarship altogether. But a number of people who aren't on Twitter—including from all three branches of the federal government—have told me that they love receiving Written Description in their email or RSS feed. Condensing patent scholarship seems like a valuable service even for these non-academic readers alone. And the pressure to keep writing new posts keeps me engaged with the recent literature in a way that I think makes me a better scholar. I don't think blogging is a substitute for scholarship, or that it will be anytime soon. Rather, I view my blogging time as similar to the time I spend attending conferences or commenting on other scholars' papers over email—one of many ways of serving and participating in an intellectual community. I still have a lot of questions about the role of law-related blogs today, and I hope we'll discuss some of them on Thursday. For example: Has the role of blogs shifted with the rise of Twitter? Should blog authors have any obligation to study or follow journalism ethics and standards? How do blog authors think about concerns of bias? For many patent policy issues, the empirical evidence base isn't strong enough to support strong policy recommendations—do blog authors have any obligation to raise counterarguments and conflicting evidence for any decisions or academic papers they are highlighting? What are the different financial models for blogs, and how might they conflict with other blogging goals? (This may be similar to the conflicts traditional media sources face: e.g. clickbait to drive readership can come at the cost of more responsible reporting.) Do the ethical norms of blog authorship differ from those of scholars? How should blogs consider issues of diversity and inclusion when making choices about people to spotlight or to invite for guest authorship? I'll conclude by noting that for PatCon8 at the University of San Diego School of Law, I tried a new blogging approach: I live Tweeted the conference and then published a Tweet recap. (Aside: I started those Tweets by noting that 19% of PatCon8 participants (13 out of 68) were women. The PatCon9 speaker list currently has 24% (7 out of 29) women speakers, but I don't know which direction non-speaker participants will push this.) For PatCon9, should I (1) live Tweet again (#PatCon9), (2) just do a blog post with some more general reactions (as I've done for some conferences before), or (3) not blog about the conference at all? This article seeks to create an early empirical benchmark on registrations of marks that would have failed registration as “scandalous” or “immoral” under Lanham Act Section 2(a) before the Court of Appeals for the Federal Circuit’s In re Brunetti decision of December, 2017. The Brunetti decision followed closely behind the Supreme Court’s Matal v. Tam and put an end to examiners denying registration on the basis of Section 2(a). In Tam, the Supreme Court reasoned that Section 2(a) embodied restrictions on free speech, in the case of “disparaging” marks, which were clearly unconstitutional. The Federal circuit followed that same logic and labeled those same Section 2(a) restrictions as unconstitutional in the case of “scandalous” and “immoral” marks. Before the ink was dry in Brunetti, commentators wondered how lifting the Section 2(a) restrictions would affect the volume of registrations of marks previously made unregistrable by that same section. Predictions ran the gamut from “business as usual” to scenarios where those marks would proliferate to astronomical levels. Eleven months out from Brunetti, it is hard to say with certainty what could happen, but this study has gathered the number of registrations as of October 2018 and the early signs seem to indicate a future not much altered, despite early concerns to the contrary. The study focuses not on the Supreme Court, but on the Federal Circuit, which already allowed Brunetti to register FUCT. Did this lead to a stampede of scandalous marks? It's hard to define such marks, so he started with a close proxy: George Carlin's Seven Dirty Words. This classic comedy bit (really, truly classic) nailed the dirty words so well that a radio station that played the bit was fined and the case wound up in the Supreme Court, which ruled that the FCC could, in fact, ban these seven words as indecent. So, this study's assumption is that the filings of these words as trademarks are the tip of the spear. That said, his findings about prior registrations of such words (with claimed dual meaning) are interesting, and show some of the problems that the court was trying to avoid in Matal v. Tam. It turns out, not so much. No huge jump in filings or registrations after Brunetti. More interesting, I thought, was the choice of words. Turns out (thankfully, I think) that some dirty words are way more acceptable than others in terms of popularity in trademark filings. You'll have to read the paper to find out which. How much time should the U.S. Patent & Trademark Office (USPTO) spend evaluating a patent application? Patent examination is a massive business: the USPTO employs about 8,000 utility patent examiners who receive around 600,000 patent applications and approve around 300,000 patents each year. Examiners spend on average only 19 total hours throughout the prosecution of each application, including reading voluminous materials submitted by the applicant, searching for relevant prior art, writing rejections, and responding to multiple rounds of arguments from the applicant. Why not give examiners enough time for a more careful review with less likelihood of making a mistake? In a highly-cited 2001 article, Rational Ignorance at the Patent Office, Mark Lemley argued that it doesn’t make sense to invest more resources in examination: since only a minority of patents are licensed or litigated, thorough scrutiny should be saved for only those patents that turn out to be valuable. Lemley identified the key tradeoffs, but had only rough guesses for some of the relevant parameters. A fascinating new article suggests that some of those approximations were wrong. In Irrational Ignorance at the Patent Office, Michael Frakes and Melissa Wasserman draw on their extensive empirical research with application-level USPTO data to conclude that giving examiners more time likely would be cost-justified. To allow comparison with Lemley, they focused on doubling examination time. They estimated that this extra effort would cost $660 million per year (paid for by user fees), but would save over $900 million just from reduced patent prosecution and litigation costs. I'm a big fan of transformative use analysis in fair use law, except when I'm not. I think that it is a helpful guide for determining if the type of use is one that we'd like to allow. But I also think that it can be overused - especially when it is applied to a different message but little else. In today’s world, whether use of a copyrighted work is “transformative” has become a central question within the fair use test. The U.S. Supreme Court first endorsed the transformative use term in its 1994 Campbell decision. Since then, lower courts have increasingly made use of the transformative use doctrine in fair use case law. In fact, in response to the transformative use doctrine’s seeming hegemony, commentators and some courts have recently called for a scaling back of the transformative use concept. So far, the Supreme Court has yet to respond. But growing divergences in transformative use approaches may eventually attract its attention. But what is the actual state of the transformative use doctrine? Some previous scholars have empirically examined the fair use defense, including the transformative use doctrine’s role in fair use case law. But none has focused specifically on empirically assessing the transformative use doctrine in as much depth as is warranted. This Article does so by collecting a number of data from all district and appellate court fair use opinions between 1991, when the transformative use term first made its appearance in the case law, and 2017. These data include how frequently courts apply the doctrine, how often they deem a use transformative, and win rates for transformative users. The data also cover which types of uses courts are most likely to find transformative, what sources courts rely on in defining and applying the doctrine, and how frequently the transformative use doctrine bleeds into and influences other parts of the fair use test. Overall, the data suggest that the transformative use doctrine is, in fact, eating the world of fair use. The Article concludes by analyzing some possible implications of the findings, including the controversial argument that, going forward, courts should rely even more on the transformative use doctrine in their fair use opinions, not less. 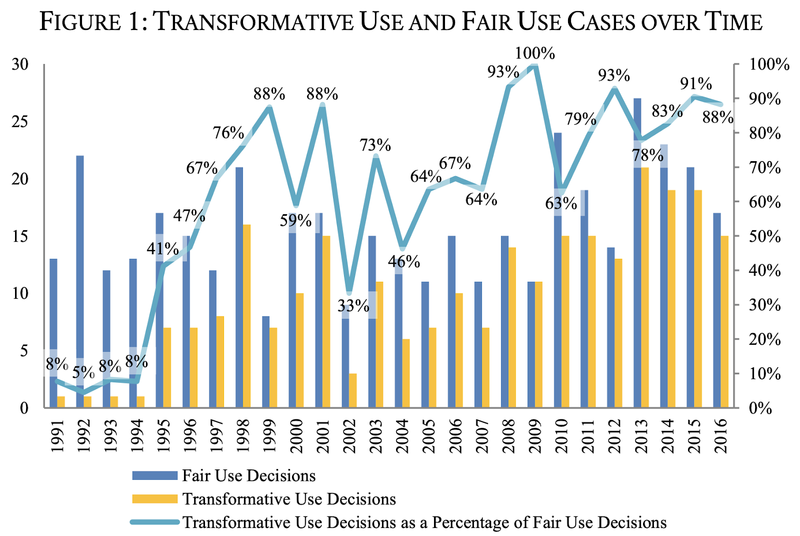 In the last six years of the study, some 90% of the fair use opinions consider transformative use. * This doesn't mean that the the reuser won every time - quite often, courts found the use to not be transformative. Indeed, while the transformativeness finding is not 100% dispositive, it is highly predictive. This supports Asay's finding that transformativeness does indeed seem to be taking over fair use. One of my favorite article titles (and also an article a like a lot) is Who Cares What Thomas Jefferson Thought About Patents? Reevaluating the Patent 'Privilege' in Historical Context, by Adam Mossoff. The article takes on the view that Jefferson's utilitarian view of patents should somehow reign, when there were plenty of others who had different, natural law views of patenting. I don't have much more to say about the article, other than that it is a great and interesting read. I'm a big fan of papers like this, and I think this one is done well. There are few patent law topics that are so heatedly debated as patent holdup. Those who believe in it, really believe in it. Those who don't, well, don't. I was at a conference once where a professor on one side of this divide just..couldn't...even, and walked out of a presentation taking the opposite viewpoint. The debate is simply the following. The patent holdup story is that patent holders can extract more than they otherwise would by asserting patents after the targeted infringer has invested in development and manufacturing. The "classic" holdup story in the economics literature relates to incomplete contracts or other partial relationships that allow one party to take advantage of an investment by the other to extract rents. You can see the overlap, but the "classic" folks think that patent holdup story doesn't count, because there's no prior negotiation - the party investing has the opportunity to research patents, negotiate beforehand, plan their affairs, etc. The core of their descriptive argument is that both "classic" and patent holdup are based on a path dependence: one party invests sunk costs and thus is at the mercy of the other party. In this sense, they are surely correct (if we don't ask why the party invested). And the payoff from this is nice, because it allows them to build a model that critically examines sunk costs (holdup) v. switching costs (not holdup). The irony of this, of course, is that it's theoretically irrational to worry about sunk costs when making future decisions. But I guess I'm not entirely convinced by the normative parallel. The key in all of these cases is transactions costs. So, the question is whether the transactions costs of finding patents are high enough to warrant the investment without expending them. The authors recognize the problem, and note that when injunctions are not possible parties will refuse to pay a license because it is more profitable to do so (holdout). But their answer is that just because there is holdout doesn't mean that holdup isn't real and a problem sometimes. Well, sure, but holdout merely shifts the transactions costs, and if it is cheaper to never make an ex ante agreement (which is typical is these days), then it's hard for me to say that being hit with a patent lawsuit after investment is the sort of path dependence that we should be worried about. I think this is an interesting and thoughtful paper. There's a lot more than my brief concerns. It attempts to respond to other critiques of patent holdup, and it provides a framework to debate these questions, even if I'm not convinced by the debate. In their 2016 paper, Manufacturing Barriers to Biologics Competition and Innovation, Price and Rai argue the use of trade secrets to protect biologics manufacturing processes is a social detriment. They go on to argue policymakers should demand more enabling disclosure of biologics manufacturing processes, either in patents or biologics license applications (BLAs). The authors premise their arguments on an assessment that (1) variations in the synthesis process can unpredictably affect the structure of a biological product; (2) variations in the structure of a biological product can unpredictably affect the physiological effects of the product, including immunogenicity; and (3) analytical techniques are inadequate to characterize the structure of a biological product. I am more optimistic than Price and Rai that researchers will soon overcome all three challenges. Where private-sector funding may fall short, grant-funded research has already led to tremendous advances in biologics development technology. Rather than requiring more specific disclosure of synthesis processes, as Price and Rai recommend, FDA could and should require more specific disclosure of structure, harmonizing biologics regulation with small molecule regulation. FDA should also incentivize development of industrial scale cell-free protein synthesis processes. One of the more curious features of patent law is that patents can be challenged by anyone worried about being sued. This challenge right allows potential defendants to file a declaratory relief lawsuit in their local federal district court, seeking a judgment that a patent is invalid or noninfringed. To avoid this home-court advantage, patent owners may file a patent infringement lawsuit first and, by doing so, retain the case in the patent owner’s venue of choice. But there is an unfortunate side effect to such preemptive lawsuits: they escalate the dispute when the parties may want to instead settle for a license. Thus, policies that allow challenges are favored, but they are tempered by escalation caused by preemptive lawsuits. To the extent a particular challenge rule leads to more preemptive lawsuits, it might be disfavored. This article tests one such important challenge rule. In MedImmune v. Genentech, the U.S. Supreme Court made it easier for a potential defendant to sue first. Whereas the prior rule required threat of immediate injury, the Supreme Court made clear that any case or controversy would allow a challenger to file a declaratory relief action. This ruling had a real practical effect, allowing recipients of letters that boiled down to, “Let’s discuss my patent,” to file a lawsuit when they could not before. This was supposed to help alleged infringers, but not everyone was convinced. Many observers at the time predicted that the new rule would lead to more preemptive infringement lawsuits filed by patent holders. They would sue first and negotiate later rather than open themselves up to a challenge by sending a demand letter. Further, most who predicted this behavior—including parties to lawsuits themselves—thought that non-practicing entities would lead the charge. Indeed, as time passed, most reports were that this is what happened: that patent trolls uniquely were suing first and negotiating later. But to date, no study has empirically considered the effect of the MedImmune ruling to determine who filed preemptive lawsuits. This Article tests MedImmune’s unintended consequences. The answer matters: lawsuits are costly, and while “quickie” settlements may be relatively inexpensive, increased incentive to file challenges and preemptive infringement suits can lead to entrenchment instead of settlement. Using a novel longitudinal dataset, this article considers whether MedImmune led to more preemptive infringement lawsuits by NPEs. It does so in three ways. First, it performs a differences-in-differences analysis to test whether case duration for the most active NPEs grew shorter after MedImmune. One would expect that preemptive suits would settle more quickly because they are proxies for quick settlement cases rather than signals of drawn out litigation. Second, it considers whether, other factors equal, the rate of short-lived case filings increased after MedImmune. That is, even if cases grew longer on average, the share of shorter cases should grow if there are more placeholders. Third, it considers whether plaintiffs themselves disclosed sending a demand letter prior to suing. This article presents an empirical study based on all reported transformative use decisions in U.S. copyright history through January 1, 2017. 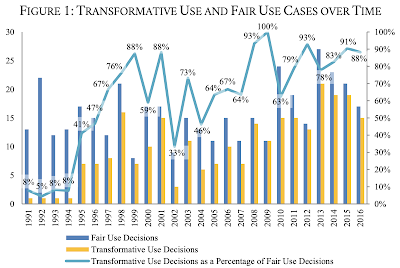 Since Judge Leval coined the doctrine of transformative use in 1990, it has been gradually approaching total dominance in fair use jurisprudence, involved in 90% of all fair use decisions in recent years. More importantly, of all the dispositive decisions that upheld transformative use, 94% eventually led to a finding of fair use. The controlling effect is nowhere more evident than in the context of the four-factor test: A finding of transformative use overrides findings of commercial purpose and bad faith under factor one, renders irrelevant the issue of whether the original work is unpublished or creative under factor two, stretches the extent of copying permitted under factor three towards 100% verbatim reproduction, and precludes the evidence on damage to the primary or derivative market under factor four even though there exists a well-functioning market for the use. Although transformative use has harmonized fair use rhetoric, it falls short of streamlining fair use practice or increasing its predictability. Courts diverge widely on the meaning of transformative use. They have upheld the doctrine in favor of defendants upon a finding of physical transformation, purposive transformation, or neither. Transformative use is also prone to the problem of the slippery slope: courts start conservatively on uncontroversial cases and then extend the doctrine bit by bit to fact patterns increasingly remote from the original context. This article, albeit being descriptive in nature, does have a normative connotation. Courts welcome transformative use not despite, but due to, its ambiguity, which is a flexible way to implement their intuitive judgments yet maintain the impression of stare decisis. However, the rhetorical harmony conceals the differences between a wide variety of policy concerns in dissimilar cases, invites casual references to precedents from factually unrelated contexts, and substitutes a mechanical exercise of physical or purposive transformation for an in-depth policy analysis that may provide clearer guidance for future cases. Liu also examines data such as the win rate for transformative use over time, by circuit, and by subject matter. But I particularly like that Liu is not just counting cases, but also arguing that courts are using this doctrine as a substitute for in-depth policy analysis. Does Administrative Patent Law Promote Innovation About Innovation? I am at Texas Law today for a symposium on The Intersection of Administrative & IP Law, and my panel was asked to address the question: Does Administrative Patent Law Promote Innovation? I focused my remarks on a specific aspect of this: Does Administrative Patent Law Promote Innovation About Innovation? I think the short answer, at least right now, is "no." There is a lot we don't know about the patent system. USPTO Regional Director Hope Shimabuku started her remarks today by saying that we know IP creates nearly 30 million jobs and adds $6.6 trillion to the U.S. economy each year, citing this USPTO report. But that's not what the report says. It looks at jobs and value from "IP-intensive industries," defined as ones with "IP-count to employment ratio is higher than the average for all industries considered." As the report acknowledges, it is unable to determine how much of these firms' performance is attributable to IP. And the real answer is: we don't know. In an article I reviewed for Jotwell, economist Heidi Williams recently summarized: "we still have essentially no credible empirical evidence on the seemingly simple question of whether stronger patent rights—either longer patent terms or broader patent rights—encourage research investments." And even on smaller questions, the existing evidence base is weak. As I explained in Patent Experimentalism, to make empirical progress we need some source of empirical variation. Economists often look for "natural experiments" with variation across time, across jurisdictions, or across similar technologies, and the closer that variation is to random, the easier it is to draw causal inferences. Of course, it's even better to have variation that is actually random, which is why I have joined other scholars in arguing for more use of randomized policy experiments. The USPTO has a huge opportunity here to both improve the patent system and help address the key administrative law challenge of encouraging accurate and consistent decisions by a decentralized bureaucracy. There are many questions the agency could help answer using more randomization, as I discuss in Patent Experimentalism. During the panel today, I noted two potential areas: experimenting with the time spent examining a given patent (see this great forthcoming article by Michel Frakes and Melissa Wasserman) and with the possibility that examiner bias affects the gender gap in patenting (which fits within the agency's recent mandate from Congress). I noted ways that each could be designed as opt-in progress to encourage buy-in from applicants and from examiners. But my main point was not that the USPTO should adopt one of these particular experiments—it was that the agency should study something in a way that allows us to draw rigorous inferences. Failing to do so seems like a tremendous missed opportunity. The conventional wisdom (my anecdotal experience, anyway) is that the availability of insurance fuels lawsuits. People that otherwise might not sue would use litigation to access insurance funds. I'm sure there's a literature on this. But most insurance covers both defense and indemnity - that is, litigation costs and settlements. But what if the insurance covered the defense and not any settlement costs? Would that serve as a disincentive to bring suit? It surely would change the litigation dynamic. On reading the abstract, I was skeptical. After all, there are a bunch of reasons why more firms would defend against NPEs , why NPEs would be less likely to assert, and so forth. But the interesting dynamics of the patent litigation insurance market have me more convinced. Apparently, the insurance didn't cover any old lawsuit; instead, only specific patents were covered. So, the authors were able to look at the differences between firms asserting covered patents, firms that held both covered and non-covered patents, and firms that had no covered patents. Because each of these firms should be equally affected by background law changes, the differences should be limited to the role of insurance. And that's what they find, unsurprisingly. Assertions of insured patents went down as compared to uninsured patents, and those cases were less likely to settle -- even with the same plaintiff. My one concern about this finding is that patents targeted for insurance may have been weaker in the first place (hence the willingness to insure), and thus there is self-selection. The paper presents some data on the different patents in order to quell this concern, but if there is a methodological challenge, it is here. This is a longish paper for an empirical paper, in part because they develop a complex game theory model of the insurance purchasing, patent assertion, and patent defense. It is interesting and worth a read. Columbia Sci. & Tech. L. Rev.